Plant tissue culture (PTC) is a set of techniques for culturing cells, tissues, or organs in an aseptic medium with a defined chemical composition, in a controlled environment. Tissue culture, when combined with molecular biology techniques, becomes a powerful tool for the study of metabolic pathways, elucidation of cellular processes, genetic improvement and, through genetic engineering, the generation of cell lines resistant to biotic and abiotic stress, obtaining improved plants of agronomic interest, or studying the complex cellular genome. 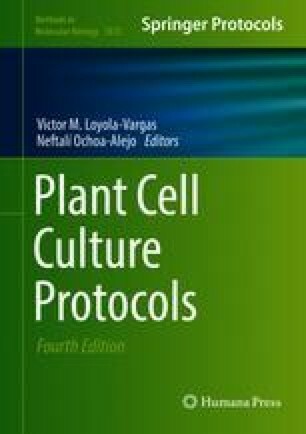 In this chapter, we analyze in general the use of plant tissue culture, in particular protoplasts and calli, in the implementation of CRISPR/Cas9 technology. The work from VMLV laboratory was supported by a grant received from the National Council for Science and Technology (CONACyT, Frontiers of Sciences, 1515).